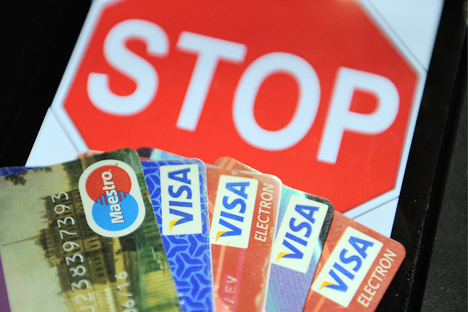 The international payment system Visa has demanded that Russian banks stop servicing its cards in Crimea. The company has attributed its decision to a new package of sanctions. Visa and Mastercard have announced that they will no longer service card transactions in Crimea, citing the latest round of U.S. sanctions as justification. On Dec. 26, the international payment systems notified Russian banks that they must suspend transactions with their cards on the territory of Crimea, which was annexed by Russia in March following a controversial referendum whose legality is widely questioned. Crimea’s new status has been recognized by 13 states to date. Visa issued a brief official statement confirming that it could no longer support the issue and acceptance of its cards in Crimea and their servicing at ATMs. "Due to the latest U.S. sanctions imposed against Crimea by [Barack Obama's] Executive Order of Dec. 19, 2014, Visa is now prohibited from offering Visa-branded products and services to Crimea. This means that we can no longer support card issuing and merchant/ATM acquiring services in Crimea," the statement said. Later a similar statement was also issued by MasterCard. Having said that, according to a Kommersant source in the banking sector, Russian banks can be denied servicing only if Visa can identify a transaction as taking place in Crimea. "The thing is that international payment systems cannot see the location of where a transaction took place unless its details directly feature Crimea, for instance in the name of a retailer,” he explained. “It means that in most cases they cannot block cards issued by a Russian bank if they are used in Crimea and they are not able to control whether the banks comply with their instruction either." The source went on to add that banks that had risked entering the Crimean market are unlikely to rush to implement Visa's instructions. Nevertheless, some Russian banks promptly issued a warning to their clients, advising them to use cash for transactions in Crimea. The Kommersant source told the paper that "in the short-term, other American companies (Google, Apple) would have to follow the payment systems' example too.” In any event, he continued, it would contribute to speeding up efforts to create a national payment system in order not to depend on foreign companies for transactions inside the country.